Seven members of the House Budget Committee are going to take a closer look at areas where the budgets for the Departments of Mental Health, Health and Senior Services and Social Services might be reduced. 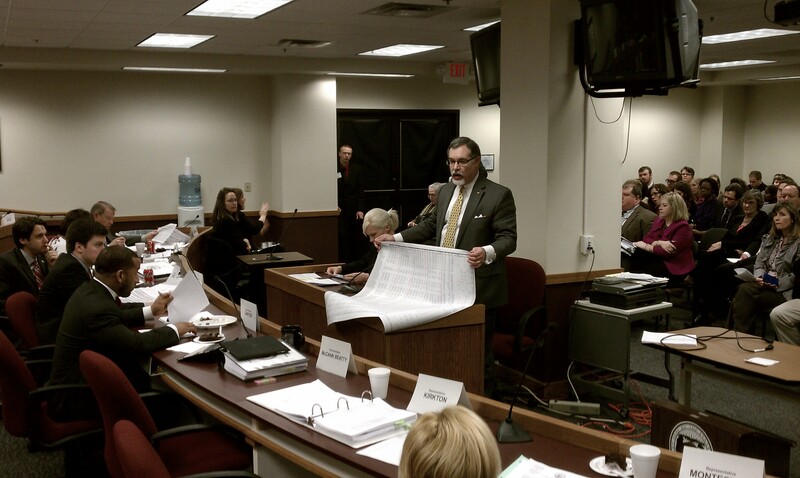 Representative Tom Flanigan presents part of his Appropriations Committee's budget to the full Budget Committee. The Appropriations Committee covering those agencies recommended that New Decision Items within those budgets receive 75% funding. Chairman Tom Flanigan (R-Carthage) explained to the Budget Committee Wednesday that his intent was to force a supplemental budget in January when better information is available related to those items, and what funding is still necessary at that time can be provided. Flanigan noted that his committee does not have authority to make cuts. See what’s in those budget bills, HB 2010 and HB 2011. The members of the working group are Republicans Rick Stream of Kirkwood, Sue Allen of Town and Country, Grisamore and Flanigan and Democrats Chris Kelly of Columbia, Gail McCann Beatty of Kansas City and Jeanne Kirkton of Webster Groves. Kirkton says supplemental budget bills are expected to come out early next week, so the working group will have to work fast. The State Department of Mental Health is hosting a two-day State Suicide Prevention Conference in Jefferson City. It includes workshops and feature presentations from professionals, family members, and suicide survivors. The Mental Health Department’s Bob Bax points out suicide is a serious public health issue that impacts individuals, families, and entire communities. "In 2007, there were 810 suicides in Missouri," said Bax in an interview with the Missourinet. "Another perspective on that would be that’s an average of one suicide every 10 hours and 49 minutes." Many Missourians might not realize how high a number that is in comparison to other causes of death. "Suicide kills more people in Missouri than drunk driving does, than AIDS does, or homicide," said Bax. "So, it has a far-reaching impact." A major cause of suicide is depression – a topic that is being discussed, in great detail, at this gathering. "Some of the workshops and presentations at this conference will deal with just that," said Bax. "What are some of the warning signs? And, then, if you have an indication someone may be at risk for suicide, what do you do?" Several state agencies and departments are taking part, as are county health agencies, school districts, and some faith-based organizations. The faltering economy has more people seeking mental health services. The stories have sprinkled the national news: People killing themselves and sometimes their families over financial woes. Laine Young-Walker, Associate Medical Director of the Department of Mental Health, says she’s not surprised. She says when people are hopeless they don’t think appropriately or logically. Young-Walker says says the economic decline adds to people not getting the help they need, because some of them can’t even afford to get to a doctor. Financial stress can lead to a multitude of mental issues that materialize into substance abuse, domestic abuse and more. Laine-Walker, who specializes in child psychology, says children, too, can be victims of economy anxiety. When parents lose their jobs or have to move, they might be shifted into new surroundings, new schools, have to make new friends, and that it really affects everyone in the family’s physical and mental health. Because Missouri has a noted shortage of psychiatrists, who can prescribe medication, the increase in demand for services is complicating an already stressed system. The legislature is considering a bill that would allow psychologists with certain certifications to prescribe medicine, meaning some patients wouldn’t have to wait months to see a psychiatrist. Proponents of the bill say some other states as well as the military have already successfully implemented that system, and that it would ultimately save thousands of lives. Young-Walker says all Missouri counties have a community mental health center. She says those who need mental health services but don’t know where to turn can get a crisis appointment there, usually on the same day. She says the Department of Mental Health can also provide many resources. To find a mental health center in your area, visit The Missouri Coalition of Community Mental Health Centers. Advocates for the mentally ill are pleading with state lawmakers not to automatically consider budget cuts to the Mental Health Department to cope with declining state revenues. Everyone seems acutely aware of the state of the economy, but perhaps none more than those appearing before the Senate Appropriations Committee recently. Mary Sullivan is with the Missouri Association of County Developmental Disabilities Services. "We have recognized the difficult situation that everyone’s in with the national and state economy," Sullivan told the committee, "But (we) find it critical that we continue to support Missouri’s most vulnerable citizens." Sullivan has urged senators to protect the health and safety of the mentally ill.
Kathy Brown represents 13 organizations as part of the Congress on Disabilities and apologizes to senators for voicing needs during difficult economic times. "I wish that we had a shorter, short list of policy priorities," Brown said during her testimony before the committee, "The list seems sort of long, but the reality is that there are significant needs that people with disabilities have in the community." The legislature returns to the Capitol this year. The state budget tops everyone’s priority list. The Christmas season and the New Year just around the corner might be a time of joy and happiness for many Missourians, but for some this is a time of tremendous stress. The Missouri Department of Mental Health is urging families, friends, and co-workers to support each other during the holiday period. The Department’s Bob Bax says the demands of the season often add to stress that already exists in the lives of many Missourians. Bax says that while the natural support systems like families and friends can work for those dealing with holiday-related stress, there are resources available for people who might be at greater risk and in need of serious help. The Suicide Prevention Hotline, for instance, is manned 24 hours a day at 800-273-TALK. State budget cuts are coming. How harsh they will be is yet to be known. The state legislature will begin reviewing the budget immediately upon convening next year for the legislative session. Some review has already taken place. The Senate Appropriations Committee has been taking testimony in an effort to get a jump start on next year. Along with the state officials and social workers testifying before the committee were two self-proclaimed recovering alcoholics to pleaded with the committee not to cut the state drug court and treatment system. Matt Brozovich of St. James says alcoholism led him to steal $10,000 from his employer. He turned himself in and entered drug court, which he says changed his life. Brozovich now is in his fourth year of sobriety. He tells the committee that without the drug court system he would be incarcerated or dead. Similar testimony comes from Jackie Johnson of Jefferson City, 27 years without a drink or hit. She says she now is a productive member of society who prizes her family above all. Both tell committee members that funding drug courts and treatment centers is cheaper than paying for the social costs of alcoholism and drug addiction. Delivery of mental health care in Missouri is changing, thanks in large part to a $14 million dollar grant from the federal government. A federal grant, 240 people meeting to discuss mental health issues and public hearings throughout the state: it all resulted in a Comprehensive Plan for Mental Health approved by the Substance Abuse Mental Health Services Administration. Diane McFarland has been heading up Missouri’s move to change mental health, with a top priority of removing the stigma that prevents people from seeking treatment for mental illness. That stigma, says McFarland, prevents people from seeking help and prevents friends and relatives from understanding how to help those struggling with mental problems. Also high on the agenda: integrating health care with mental health care and teaching people how to better diagnose and treat their own mental health problems. McFarland says the obstacles to mental health treatment need to be torn down. She says those obstacles frustrate those seeking treatment. She says frustration can build, keep the mentally ill from getting the help they need and ultimately lead to a trip to the emergency room. McFarland says she’s excited about the changes coming to Missouri mental health care. Missouri’s Mental Health Transformation Initiative Web site. The State Mental Health Director insists the future for the Bellefontaine Habilitation Center is bright, though its mission will change significantly. No longer slated to be closed, the Bellefontaine Habilitation Center in St. Louis will get a new, $18 million facility. The center will focus on severely mentally disturbed patients; 50 to 70 of them, rather than the 300 it treated at its peak population. State Mental Health Director Keith Schafer understands the parents of Bellefontaine patients aren’t pleased. "It will be very difficult to convince those parents, to make the parents feel good about the fact that we’re dealing with a downsized facility," Schafer tells the Missourinet. Schafer says the state took a necessary step March 1st when it eliminated 125 positions. "We had to reduce our workforce to a level that’s comparable to every other hab center in the state," Schafer says, "That was traumatic, but it’s done." The Bellefontaine Center is aging. Schafer says it needs modern facilities. "This, I think, will be a turning point for Bellefontaine for the future," says Schafer. Schafer convinced Governor Blunt not to move ahead with his plans to close Bellefontaine. Blunt had threatened Bellefontaine’s closure after numerous reports of abuse and neglect of patients at the center became public. Instead, many patients have been moved to private facilities. Patients who need intense care and can’t live in the community will remain at Bellefontaine. A state representative who has been critical of the Mental Health Department’s plans for the Bellefontaine Habilitation Center in St. Louis is more in agreement with the department’s director than it might seem. Rep. Gina Walsh (D-St. Louis) opposes plans to downsize Bellefontaine, plans that went into effect in March. Walsh objects to the elimination of 125 positions as well as the transfer of 150 mentally disabled patients from Bellefontaine to private care. The state made the moves after abandoning plans to form a public-private partnership at Bellefontaine. That fell through when none of the agencies that responded to a request for proposals met state standards. The State Department of Mental Health plans to build a new, $18 million, facility at Bellefontaine. It will care for 52 profoundly disabled mental patients. Bellefontaine at one time cared for 300 mentally ill patients. Walsh supports state-run facilities and doesn’t believe private agencies can handle the difficult cases that are routine at Bellefontaine. She objects to private care even when it’s pointed out that in the past patients have been neglected and abused at the center. "If that is the case, then we need to staff them properly. We need to train the staff properly and we need to pay them a living wage," Walsh says, "Those are three things that we don’t often do in this state." She gets no argument from Mental Health Director Keith Schafer who says direct care staff get about $10.20 an hour. "That’s a little bit above McDonalds," Schafer says, "but the work these folks have to do is extremely stressful." Schafer says there’s no doubt mental health workers need more money. Schafer says he’s disheartened by the fact that few mental health workers now make work with the Department of Mental Health their career. He denies, though, allegations that the reduction of the Bellefontaine workforce places any patient at risk. Schafer points out only 34 of the 125 positions eliminated were occupied. Bellefontaine now employs 520 and Schafer says that is plenty to meet the needs of the facility. Walsh, though, says insufficient staffing levels create a poor environment for patients. "There’s your answer right there," Walsh says, "If you have the right amount of employees, these incidents (abuse of patients) will reduce."